Wow, I hope I'm not the only one hear to say that is one hell of an awesome process you went through. And honestly, I think the second to last sketch idea is incredible. Kind of a shame that wasn't the final version. The shading on the face is pretty darn tight! 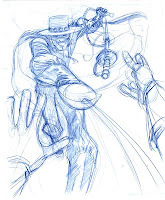 Comic Twart art blog, week one - ZORRO! Drawing for fun - ELEKTRA LIVES! The Goon in "It's all fun and games til..."